Meet real women who have had real results on our results page. Here you can learn how four of our brave members are willing to share their stories and how they have over- come all sorts of obstacles; physically, mentally & emotionally. You, too, can experience success just like them! Below are four brave women who have been willing to put their stories out in hopes you can relate to them and you become inspired to overcome your weight problem too. Here you can learn a little about their personal story, how they’ve overcome adversities and truly live a healthy, happy lifestyle now. If you find yourself relating to being a mother of teenagers, a divorcee, an empty-nester, a grandmother or even a baby boomer ready to finally take care of you, contact me and we can see if this program may be the right fit for you. Can you see yourself in their stories? 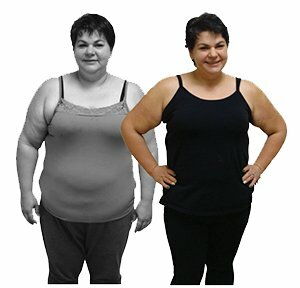 Beky added years to her life and gained confidence! As a working woman, wife and mother of teenagers Beky’s needs would always come last. She was afraid to spend money on herself or take time for her because she was concerned it take away from her kids. She would go home after work day after day, completely depleted, with no energy, spending each evening sinking in to her favorite chair. By taking the time to invest in her health and realizing it was not taking away from her family she has now become an engaged, happy, healthy, mom and wife! “Before I started working with Emmie, I was angry, helpless, void of emotion, unhealthy and overweight. I have found a new lease on life–a renewal that I never thought possible! I have lost over 65 pounds, but more than the weight, my health has improved 10-fold. My success stems from my willingness to participate in each and every thing that Emmie offers me. I have chosen to make Blissfully Healthy my life and I love every minute of it. 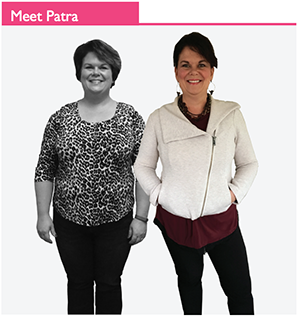 Patra added years to her life and gained confidence! As with most life changes Patra’s weight would change up and down for years and years. Shortly after high school she found herself beginning to diet and joined many different programs only to find some that worked part time and others that just couldn’t be sustained. After some tough life decisions Patra found herself a single woman destined to live the rest of her life the way she always dreamed of, and that included being healthy. She met Emmie shortly after and jumped in with both feet. Now, two years later Patra is a graduate of the program and continues to use the principles Emmie introduced and has easily kept the weight off! 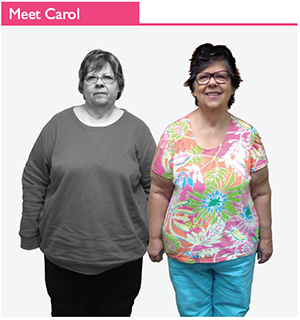 Carol regained control over her health with confidence and sparkle! 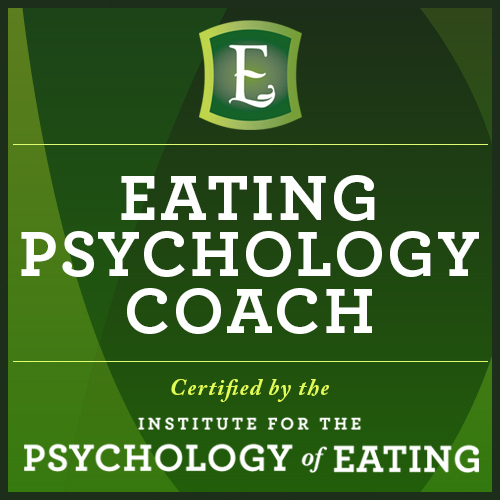 After being a life-long dieter, Carol was in need of support to overcome emotional eating. As a widow, Carol experienced how diabetes and alzheimers took a toll on her husband and she was afraid that was going down that same path. She was fearful that she was ‘too old and didn’t have enough time left to become healthy’. Since joining Blissfully Healthy a year ago she has regained control, her confidence and her sparkle. 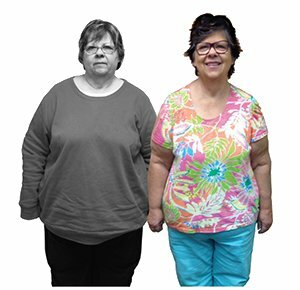 Trudy was able to regain her confidence, her stamina and add years to her life! As a successful small business owner, Trudy struggled with being busy and found herself putting her health on the back burner. 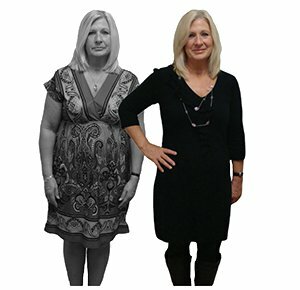 She felt like she needed to eat small meals and always perfectly because she thought since she was ‘”older” her metabolism would be slower. 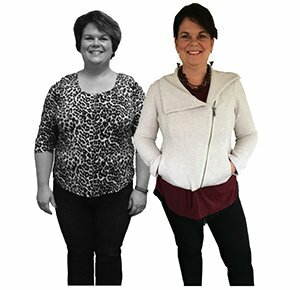 By integrating a simple program of healthy eating and simple exercises that could be on the go, we were able to engage her metabolism and find her a healthy lifestyle she could embrace even on the craziest of days.